Submitted Photo Pictured from left, Andrea Polowy, social worker; Ginny Hill and Karen Lucks, associate director. 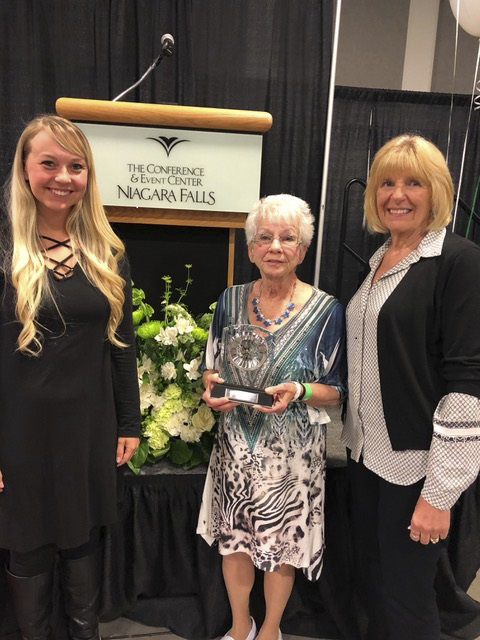 On May 24, Virginia “Ginny” Hill was awarded the Caregiver Appreciation Award at the Developmental Disabilities Awareness Day which took place at the Niagara Falls Convention Center in Niagara Falls, New York. She was nominated by Chautauqua Adult Day Services. Ginny first opened her home for the OPWDD (Office for People With Developmental Disabilities) Family Care program in 1992 and has had an active family care home since that time. Chautauqua Adult Day Services has worked with Ginny for many years and truly appreciates the care that she provides. She makes everyone that lives with her feel like family. In fact, those that live in her home tend to call her “Mom.” Ginny has made it her mission to ensure that she is promoting the lives of those in her home and making them a part of her family. She ensures that they are very active in the community, the neighborhood, and get to explore the world around them. All of the individuals that have attended Chautauqua Adult Day Services and have lived in Ginny’s home over the years have loved living with her. Ginny is one of the greatest examples of how family care can change an individual’s life for the better by providing the love that they may never have had before. Chautauqua Adult Day Services, offers senior day programs for adults 60 years of age and older who live in the community. The day programs enable seniors to remain at home and obtain quality of life through socialization and activity programming. In addition to providing a break for caregivers, the sites provide breakfast, snack and a hot noon time meal for participants. There is also a Community Recreation Program that helps our seniors participate in outings in the community. The sites offer pet therapy, ceramics, music programs, arts and crafts and much more on an ongoing basis. In addition, the agency also has a “Saturday Program” in Jamestown which helps participants stay involved in community events and out-door recreation. Funding is available. The Chautauqua Adult Day Services, is a not-for-profit United Way community partner, that provides an affordable option for older adults in the community to remain independent and at home. Chautauqua Adult Day Services has four sites throughout Chautauqua County. For information visit www.seniordayprograms.com.